Atoka Motorsports Park in Atoka, Oklahoma has announced their 2017 race schedule. Their highlight event will be the 19th Annual Heartland Nationals, held on Memorial Weekend May 26-28. This is always a great event. AMP will also hold their big Fall Fest event October 13-15 and the “Dirt Outlaw” Belt Race to conclude the season November 11. Atoka also holds monthly point series event with multiple classes for both Cars and ATVs. For more on Atoka Motorsports Park, go to www.AtokaSandDrags.com. To view the full schedule, click “Read More”. Avenal Sand Drags in Avenal, CA has released their 2017 race schedule. They will once again have two events with the Spring Nationals happening April 28-30 followed by the Fall Nationals October 21-22. The Spring Nationals will feature Friday action with the remainder of eliminations from the postponed 2016 Fall Nationals as well as other racing To Be Announced. For more info on Avenal Sand Drags, go to www.AvenalSandDrags.com. Get ready for the 45th Las Vegas Jeep Club Jamboree over President's Day Weekend (Feb 18-19) at the Dumont Dunes, CA. This great event is back with Hill Climb action on Saturday & 300' Sand Drags on Sunday. NSDN will be on-site with coverage from this event. For more info, check out the LVJC Association Page on NSDN. Click Read More to view the Event Flyer. The 2016 Avenal Sand Drags Fall Nationals took place in Mid October at the Central California area track. Another solid turnout of racers made the trip to compete for top honors at this race. Unfortunately, Mother Nature had other ideas and cut the race short on Sunday afternoon by sending in a freak massive wind storm that created unsafe racing conditions. The storm created blowing sand conditions that made it uncomfortable just standing outside, let alone trying to race. Sunday’s Heads-Up & Pro Bracket eliminations will be completed on Friday of the 2017 Avenal Sand Drags Spring Nationals (April 28). Let’s take a look at the great racing action that was able to take place earlier in the weekend. 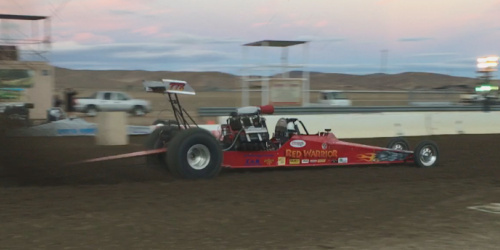 The SCSDA Hammer Down Nationals was an incredible weekend of 300’ sand drag racing in Southern California. A great turnout of racers converged on the Soboba Casino in San Jacinto, CA for three days of sand drag action. The highlight of the weekend was the Saturday Night Thunder show with qualifying under the lights in front of a capacity crowd. They massive crowd witnessed some huge numbers, including several World Records being broken. Let’s run through all of the action from the 2016 SCSDA Hammer Down Nationals.